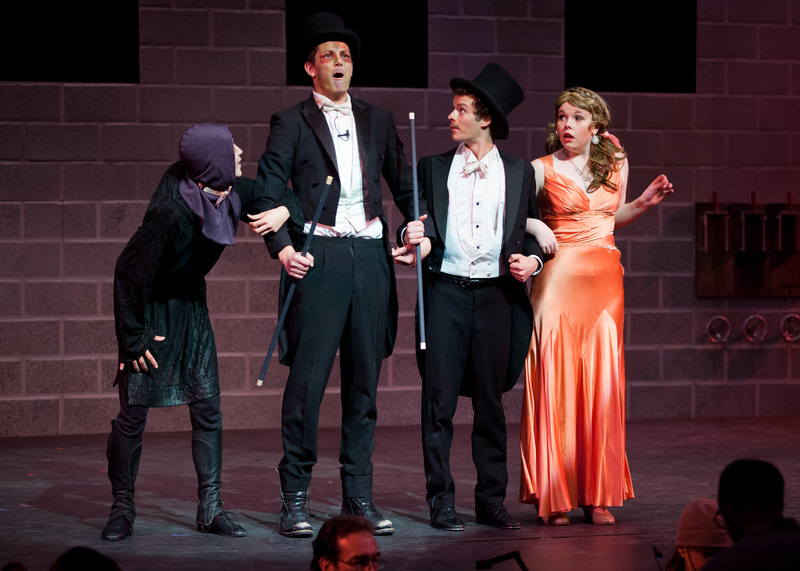 2015 marked the sixth year I sound designed and mentored students for Nathan Hale High School’s spring musical. 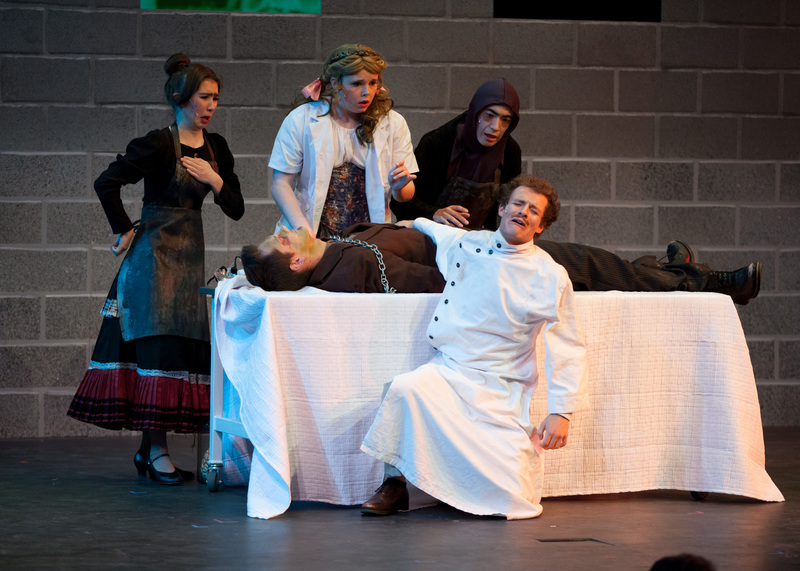 Out of all the shows I’ve designed for Nathan Hale, Young Frankenstein was my favorite. 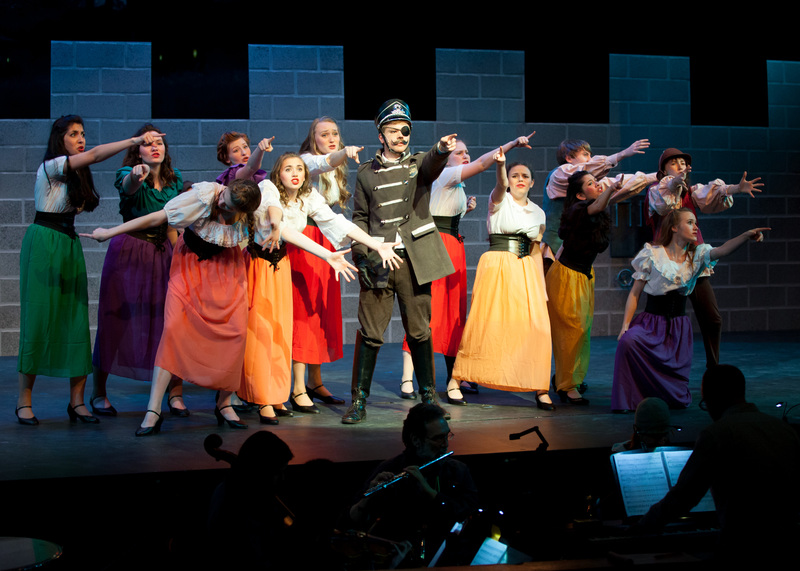 I had the most sound cues I have ever had for a musical and the kids did a phenomenal job both on and off the stage. This particular show was successful because I was able to get the students really involved. Students helped me tune the speakers for the first time, which made a world of difference in their auditorium that is an echoey concrete box. I provided them a board matrix so they could setup, patch, and label. They were running mic checks by the end of the run and doing much of the work themselves. I still ran the main mix, but was able to have one of the kids assist me as a sub mixer. Additionally since there are usually only 5-10 sound cues, I have run them from the sound board. With this particular show, sound effects play more of a role, even becoming the gag at times. I ended up with around 100 cues. This was too many for me to play while actively mixing the show, so I trained the student stage manager how to finesse the calls of his sound cues. Seeing the kids grow, develop, and take ownership of the work is a very rewarding process. 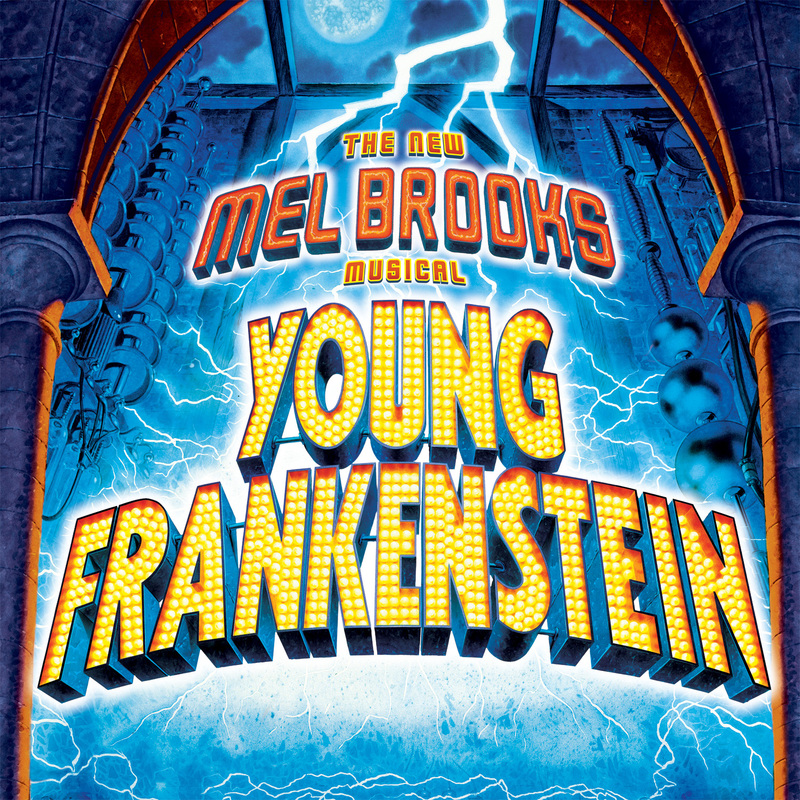 For the sound effects, it was fun being able to play in Mel Brooks’ world a little bit, especially with the melodrama built into the characters. The machines in Dr. Frankenstein’s lab are meant to be over the top, so those were great to build and layer. The scenic design featured a large projection screen at the back of the set. One particular scene had a projection of a bright and cheery meadow so I incorporated some romantic tweety birds into the scene. What is particularly gratifying about having so many effects for a musical is the ability to work with the orchestra pit to create the soundscape. The two really play off each other nicely. In fact, going back and listening to my sounds for this show didn’t have quite the same punch without the dynamics of the music accompanying it. This particular production was very well received. 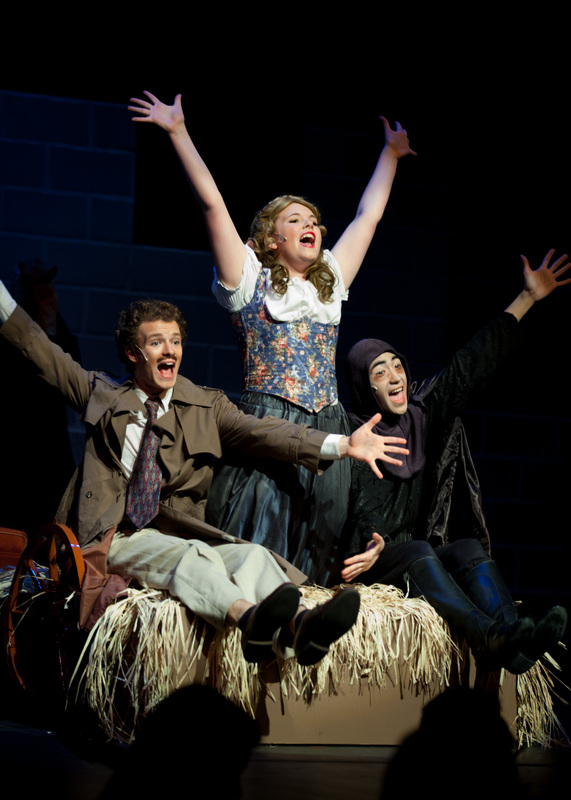 Every year, the spring musical gets reviewed by a team of adjudicators from Seattle’s 5th Avenue Theatre, one of the city’s largest producers of musicals. Usually the comments about sound reflect more on the difficulties it is to balance orchestra pit and vocals with the abundance of concrete and deprivation of acoustic treatments in the auditorium. However the sound got very positive comments from the adjudicators this year. Excellent work with balance between the instruments, and good balance with the cast. The sound designer deserves special recognition for their attention to detail. Whomever chose/created the sound effects did an excellent job – the effects greatly enhanced the mood of many scenes, and sometimes even distinguished the location, such as when the actors’ voices echoed as they were moving down into the dungeon. The sound design was excellent in this production!